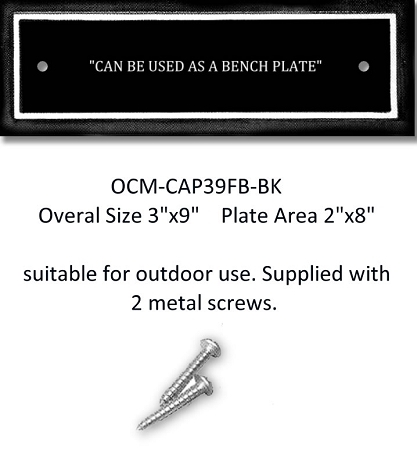 This aluminum plaque is designed to be attached to a bench or any flat surface. Made in USA. The cast aluminum plaque has a raised board with a recessed area for engraving. The plate measures 9" x 3" and the engraving portion is 2" x 8". The text is engraved on coated cast aluminum which is suitable for outdoor use. The plate holds up to 200 characters. We returned from vacation and found that our beautiful plaque was here. We highly recommend OurCornerMarket and thank them for the very speedy service. Their service was impeccable and the bench plaque is even more beautiful than we expected. We are sending a picture when it is mounted so it's possible that you'll see it on this page. Very, very nice. It's sturdy and not cheap looking. We had to replace the one that was on the bench and this one is so much better. Highly recommended.